The NYPD reportedly alerts federal immigration officials to illegal immigrants’ appearances in criminal court despite Mayor Bill de Blasio’s vow to remain a sanctuary city. Police officers booed the mayor of New York after he echoed the anti-cop rhetoric of Barack Obama, Hillary Clinton and Rev. Al Sharpton. The city’s mayor has never been popular with his police department with many, including celebrity ex-NYPD Detective Bo Dietl, who nicknamed de Blasio “Big Bird” during Deitl’s appearances on news shows on Fox News Channel and other media outlets, calling for him to resign after his anti-police statements. The display of thousands of law enforcement officials representing departments and agencies throughout the country standing in the streets of the Queens section of New York City on Saturday, to honor one of two police officers assassinated last week, was a sight not seen since the large number police and firefighter funerals following the 9-11 terrorist attack. But despite Mayor Bill de Blasio’s well-written comments during the service — such as when he said the departed Officer Rafael Ramos was a devoted family man, aspiring chaplain and hero — the animosity felt by cops for a mayor they say threw them under the bus could not be subdued by one flowery speech. 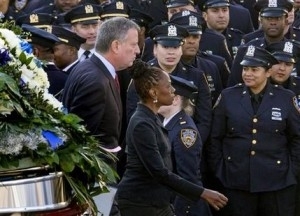 Although the cops sitting and standing inside the Christ Tabernacle Catholic Church behaved politely as Mayor de Blasio spoke, scores of New York’s Finest outside on the streets turned their backs as he and his wife passed to demonstrate their distaste for his defense and out-and-out support for anti-police protesters. While the liberal-left politicians and news outlets downplayed the violence and hate-filled speech directed at police, amateur videos showed protest marchers encouraging the killing of police officers. 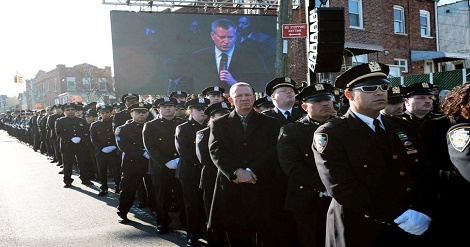 Numerous police officers turned their backs on Mayor de Blasio in protest of his anti-police comments. “I noticed that at least [President Barack] Obama and [Attorney General Eric] Holder didn’t show up. They knew it would have been a bad time for their photo ops. At least, de Blasio had the stones to show up and take the heat,” said a former New York police detective, Ronald Knudsen. 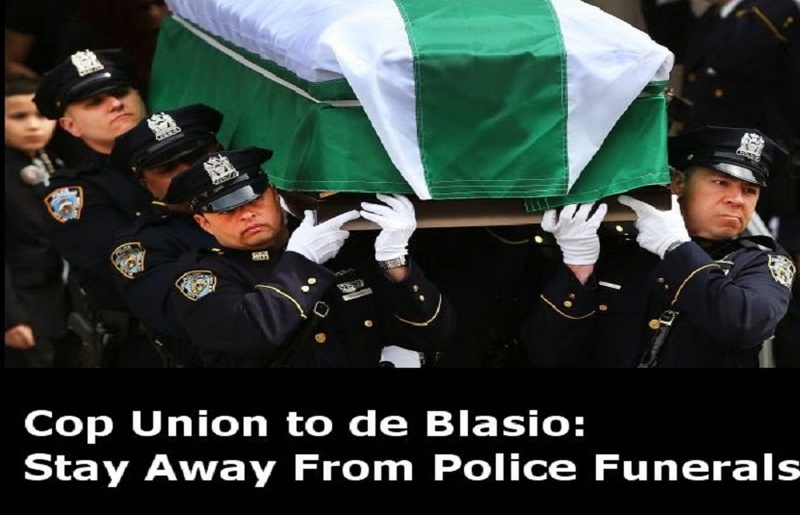 New York City’s Police Benevolent Association union officials minced no words in their blaming de Blasio for his posturing and his anti-police sentiment. It was obvious to anyone watching and listening to de Blasio he supported the angry protests when it was announced that no charges were filed in the police deaths of Michael Brown in Ferguson, Missouri, and Eric Garner in New York. Even before the cop-killings, Lynch, who spent his adult life as a cop, had urged NYPD officers to sign a petition that would forbid the mayor’s attendance or participation in the funerals of fallen police officers who die in the line of duty. The news media attempted to portray de Blasio as showing support for the NYPD since the shootings by a black Muslim repeat-offender, pointing to how he urged protesters to take time off from their demonstrations and marches. But even one of his best friends, Rev. Al Sharpton, for whom de Blasio’s wife once worked, continued the marches and protests.